Wheel Wax cleans, polishes and protects in one step! Wheel Wax is the only wax for wheels. It is easy to apply, dries to a haze and buffs to a high shine. Wheel Wax changes the surface polarity of your wheels to repel brake dust particles. Wheel Wax leaves an unbelievably smooth shine on your wheels that brake dust and moisture can't penetrate. This protective coating also makes cleaning your wheels a snap next time you wash your wheels. Don't just clean your wheels, clean and protect them in one step with Wheel Wax! Wheel Wax actually has a great cleaner in the formula which allows you to clean off brake dust and apply the great Wheel Wax protective shine in one easy step. Simply rub Wheel Wax directly on each dirty wheel and let it dry to a haze. Usually by the time you have applied Wheel Wax to all four wheels you can go back to the first one and buff it to a high shine. Wheel Wax works on all chrome, aluminum and stainless appearance pieces on your car. Don't just polish, protect with Wheel Wax! Is Wheel Wax safe for my clear coated wheels and how is Wheel Wax different from other wheel polish? Yes, Wheel Wax is clear coat safe and has a clear coat sealer to protect from cracking. Wheel Wax is not a polish, it is a cleaner and wax that is formulated with space age polymers and resins, heat resistant sealant and carnuba wax, which provides the ultimate protection for wheels. How do you apply Wheel Wax? Apply Wheel Wax directly to your brake dust covered, cool and dry wheels When applying Wheel Wax, use liberally and spread evenly, let dry to a haze and then remove with a soft cotton towel or applicator. We recommend applying Wheel Wax to all wheels and then buffing the first wheel. Will I still have to polish my wheels? Wheel Wax will at least extend time in between wheel polishing and may elimate the need to polish your wheels. Wheel Wax has been formulated to add a protective barrier to wheels, which will repel harmful brake dust and road contaminates. How often do I need to apply? Clean your wheels with Wheel Wax when they look dirty. You will notice that the time between cleanings increases as you continue to use Wheel Wax. If any other chemical, high pH soap or automatic car wash is used, then Wheel Wax should be applied again. I live in the Snow Belt. 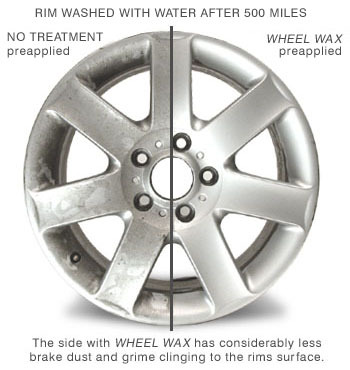 Will Wheel Wax protect my wheels against road salt and harsh winter road chemicals? Yes, Wheel Wax is designed to help combat these harsh conditions. Keep in mind, whenever road salts contact your wheels you should clean them as soon as posible to keep your wheels looking great. How long will Wheel Wax last? Wheel Wax was formulated to last longer on wheels then any other product on the market, however, the lasting power of Wheel Wax will depend on how often the wheels are cleaned, and what product is used to clean the wheels. To extend the life of Wheel Wax, clean your wheels only with pH balanced car shampoo and reapply Wheel Wax weekly. Is Wheel Wax safe for my Billet Aluminum wheels? Absolutely, Wheel Wax will pamper your expensive wheels with natural moisturizers and oils designed specially for wheels such as Billet Aluminum and will providing the ultimate protection for your wheels. The application process for polished aluminum is slightly different. Just apply Wheel Wax to your polished aluminum or billet wheels and buff to a high shine. It is not necessary to let Wheel Wax dry on polished aluminum to get the ultimate protection for your wheels. Extending drying time on polished wheels may require more work to remove the haze. Buff off quickly for best results. Should I apply Wheel Wax to my new wheels? Yes, the sooner you start with Wheel Wax protective treatments the longer your wheels will stay in new condition. After applying Wheel Wax how do I clean my wheels? Clean your wheels every week with Wheel Wax. In many cases you may only need to use a soft, damp, cotton towel to get the best results. Jay Mercer writes: Your product is wonderful, not only does it give the wheels on my LX470 a "brand new Look", but it almost completely eliminates brake dust buildup....Terific stuff!! Paul MacLeod of MA writes: Jeff Orlinsky at WheelDynamics in Natick, MA recommended WheelWax to me for my alloys. I must say that the brake dust is much less than before the product was applied! I will continue to use your fine product and of course, will spread the word about it!! Keep up the good work. Mark Hochstein writes: The product workes well. I just got this BMW and was appalled at how quickly the wheel blackened. I've never owned a car that shed this much brake dust. WheelWax has cut the dust accumulation by about 50%. Thanks a lot! Ron Winer from New York writes: I was shocked that you apply WheelWax to dirty brake dust covered wheels and the dust dissolves. There is no doubt that the WheelWax application results in better-than-new appearance on my BMW 530i & seems to repel the brake dust. Richard Kirkpatrick writes, I'm impressed!! Saw it advertised on SPEEDCHANNEL. Amazing product. I've got low dusting Raebestos QS pads on my 98 CORVETTE. This product makes the wheel surface feel like glass, and the dusting problem is about completely eliminated. THANK YOU!! This is an excellent product that will last for a few months at the most. It's very effective not only at beading water on the wheel but very good at keeping brake dust accumulation to a minimum. I thought I would try another wheel glaze that I thought might be better but definitely was not. Brake dust would start accumulating after about a week whereas the Wheel Wax kept accumulations down two weeks or more. I've learned my lesson about using a good product. If it works well, don't replace it but it is one way to find out how effective one product is compared to another. I wanted my Wheel Wax back and it's for this reason I will be highly recommending this product. ProsLongevity: It will last for a few months before re-application is necessary. Keeps brake dust down. You can go about two weeks or a little more without brake dust becoming an issue. Does an excellent job of beading water and keeping grime and other dirt off the wheel longer. ConsEven when kept at a cool room temperature, the product will break down from a pudding-like consistency to a soup-like consistency after more than six months. It still seems to work but may not be as durable in its more solid form. Have enjoyed using wheel wax. Goes on easily. After applying this wax to all of my Asanti wheels, the dirt and brake dust just blow off. Exactly as expected. Great product. Used on Polished Aluminum on 2008 Mustang GT/Premium stock polished aluminum wheels.